Announcement follow me on instagram @missknityarns to keep up to date, new items becoming available, competitions and giveaways and other yarny missknit news. 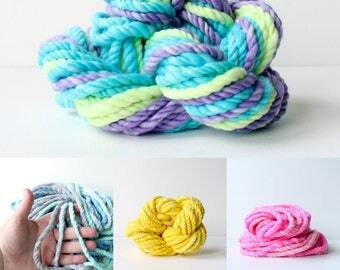 Miss Knit Yarns -seriously fun, colourful, crazy, free spirited wild hand spun art yarns. chunky hand spun art yarn for knit, crochet, weaving. I'm happy to take commissions or requests, just send me a note. follow me on instagram @missknityarns to keep up to date, new items becoming available, competitions and giveaways and other yarny missknit news. A magical dream spun into reality ..as rare as a blue diamond. The princess wished upon a star and this is what was created. hand dyed silk ribbon adds a special touch to any weave. 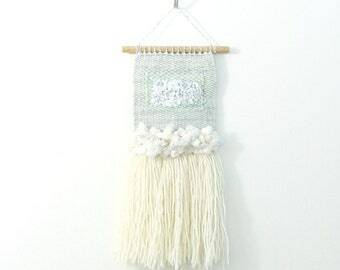 super long rya loops make an easy, yet elegant fringe. inspired by the amazing indie spinners, dyers and fibre artists i was seeing around the net I took up spinning back in 2008 to learn a new skill. i love to talk so if you have any questions or just want to talk send me a note. if you have a problem with your order please let me know. i'm often more than happy to work out a solution with you so everyone is happy. CUSTOM ORDERS: there are no refunds on custom orders unless a mistake has been made on my part. MISSING ITEMS: if an item goes missing in the post or does not arrive in a reasonable amout of time let me know and i'll fill in the forms required by australia post to start a missing item search. after the postal search (2 weeks) i am happy to refund or replace or give store credit to the same item value + postage costs. FAULTY or DEFECTIVE ITEMS: in the case of the item being defective or faulty when it arrives please let me know ASAP -14 days should be plenty of time to find faults or defects. i will offer a full refund, replacement or store credit for the same item value + postage costs. i will either require the faulty item (plus packaging, etc) to be returned to me OR photographic proof clearly showing the defect/fault. CHANGE OF MIND RETURNS: if you change your mind on a purchase (custom orders see above) you can return within 14 days of recieving. please let me know ASAP so we can discuss return details. buyer will pay return postage costs for change of mind returns. refunds will be for item cost only and not postage-i don't keep postage costs, these were paid to the post office when your items were sent to you and i can't have them refunded to me. UNCLAIMED PACKAGES: if you aren't home to recieve your package it may end up back at your local post office and will need to be picked up by you. if you choose not to pick up your package the post office will return it to me unclaimed after a certain amount of time passes. refunds will be for item cost only and not postage-i don't keep postage costs, these were paid to the post office when your items were sent to you and i can't have them refunded to me. if you still want your items you will have to pay a new postage cost. REFUSED PACKAGES: if you choose to refuse an international package because you don't want to pay import charges when the item returns to me refunds will be for item cost only and not postage-i don't keep postage costs, these were paid to the post office when your items were sent to you and i can't have them refunded to me. the buyer is responsible for return shipping costs unless we agree differently beforehand. please do not send anything back for a return/refund until we have discussed via etsy convo. **STORE CREDIT. store credit given is valid in my shop only and not etsy wide or any other etsy shops. purchases can be made either through paypal -paypal balance, credit card or etsy's direct checkout for credit cards and other payment options. for aussie buyers I can also take direct bank deposit just contact me to for details. RESERVE HOLDS- lots of my items are one of a kind treasures. so if you'd like something but can't pay today you can request a hold to be placed on the item/s for you. ** for new buyers, holds can be placed for up to a week. ** for return or repeat buyers longer holds of several weeks can be placed. if items haven't been purchased by the end of the hold time I will have to remove the hold so others can have a chance to purchase. AUSSIE BUYERS can expect their parcels in about a week after posting. i'm in NSW further states like Tassie and WA could take the full week, closer states will take less time. all aussie parcels now come with tracking included. INTERNATIONAL BUYERS parcels are sent australia post airmail which is normally up to 2-4 weeks after posting. it can take slightly longer for postal service or customs delays. if you need your item faster or want tracking/registered post let me know and i'll find out the costs for you. i do not pay import or customs duties, taxes, tarrifs and charges. these applied by your country when you buy internationally and go to your government. the buyer/person recieving package is responsible for any duties, taxes or charges. if you aren't sure about customs limits and costs please check with your local post office. i do not mark parcels as "gift" on customs forms. i also do not give a false $$ value on customs forms. it is illegal to give false information and if found out a very heft fine and possible jail time are the consequences for me so please do not ask. please make sure your etsy and paypal addresses are the same to avoid confusion about shipping. if they aren't the same i will contact you and the item won't be sent until i get a confirmation of the correct address so they aren't sent to the wrong place. i love custom orders and requests and i'm (usually) happy to deal with these. wholesale and other discussions welcome too.